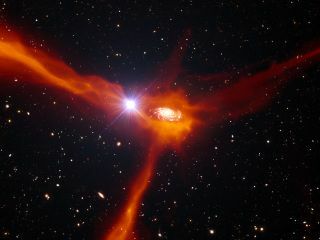 Light from the heart of a background galaxy allowed scientists to explore how galaxies refuel. In this artist's impression, a quasar, the bright object to the left of the center, shines through gas traveling from the interstellar medium into the heart of the galaxy. If galaxies were only limited to the amount of gas they formed with, they would quickly burn through their entire supply by making stars. Astronomers have long suspected that galaxies pull in resources from the universe around them to sustain themselves, but evidence of such consumption is challenging to obtain. Now a new method is allowing scientists to shine a light on how galaxies keep running. Using the illumination from the bright center of another background galaxy, scientists have revealed the best observations to date of a galaxy refueling itself. Known as a quasar, the extremely luminous source is part of a galactic center powered by a supermassive black hole. Shining through the foreground galaxy, the light from the quasar reveals not only the flow of material into the galaxy but also its motion and composition. "The cold gas — mostly hydrogen atoms — is very tenuous, so difficult to detect," lead author Nicolas Bouché, of the Research Institute in Astrophysics and Planetology in Toulouse, France, told SPACE.com by email. Previously, astronomers have used regular galaxies as background flashlights. But because such galaxies are dimmer, background sources are limited to only the brightest galaxies. Using the brighter quasar — in this case, HE 2243-60 — provides two advantages. "We can study the gas around any galaxy, regardless of its brightness," Bouché said. Such a pairing also reveals the location of the gas, what Bouché called "a critical piece of information." Using a quasar also allows for studies of more distant galaxies. The young galaxy lies approximately 11 billion light-years from the Milky Way, 80 percent of the way across the visible universe. "This is a very young galaxy, seen only 2 billion years after the Big Bang, still in its early stages of formation," Bouché said. Previous observations have revealed the presence of gas around other galaxies, but Bouché's team was able to demonstrate that the gas surrounding the foreground galaxy was being drawn into it rather than flowing out. Moving inward, the gas gradually increases speed until it eventually matches the velocity of the spinning galaxy. Instead of rushing immediately into the center, the gas gathers in the galactic halo, taking as long as 400 million years to reach the heart of the galaxy. Once there, it becomes the raw material for new stars. The inflowing gas did have a small surprise for the astronomers, containing more complex elements than most models predict. These elements form in the heart of stars, and are scattered in their explosive deaths, sometimes flowing out of their parent galaxy. "This would indicate that some mixing occurred previously — 0.5 to 1 billion years before or so —between the pristine intergalactic gas and the enriched outflows," Bouché said. The new observation method provides opportunities for more detailed studies, but comes with some limitations. "Unfortunately, the number of such 'apparent pairs,' where a background quasar happens to be situated a short distance on the sky from the galaxy, is a rare event," Bouché said. Existing pairs must then show signs of gas, in the form of outflows, accretions or other similar structures. Bouché and his team plan to continue studies of similar galaxies using a variety of telescopes and instruments. They also intend to use the ESO's Multi Unit Spectroscopic Explorer, which will come online in late 2013 or early 2014, to take a more detailed look at the pair. "This means we will be able to map out the intergalactic gas thanks to the unprecedented sensitivity of this instrument," Bouché said.